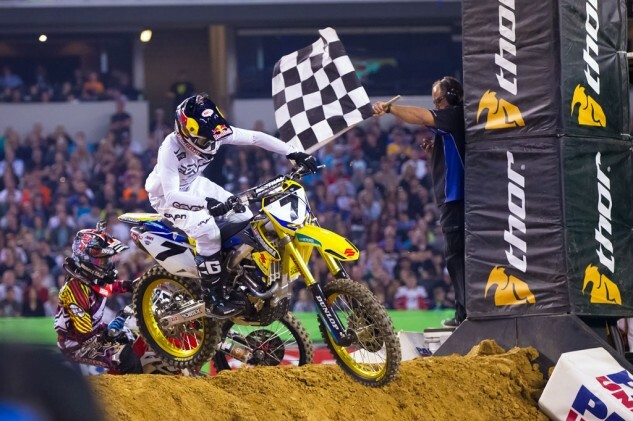 James Stewart‘s hot streak continues with his second-consecutive win and fourth AMA Supercross podium in five weeks after an impressive effort at Cowboys Stadium in Arlington, Texas. Fresh off of signing a contract extension with Yoshimura Suzuki, Stewart took control of the Arlington main event on the third lap, passing holeshot-taker Ryan Dungey and running away with the win. With his win last week at San Diego, Stewart becomes the first rider to win back-to-back races this season and establishes himself as a championship contender as we approach the mid-way point of the 2014 season. Dungey finished comfortably in second for only his third podium in seven rounds this season. 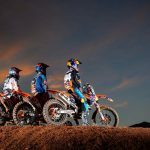 The Red Bull KTM rider has yet to win a race this season but remains in the title picture in fourth place overall. Team Muscle Milk Honda’s Justin Barcia completed the podium, finishing ahead of series points leader Ryan Villopoto of Kawasaki. The Arlington round also marked the start of the Eastern Regional 250 class season. Adam Cianciarulo led the way finishing ahead of teammates Blake Baggett and Martin Davalos for an all-Monster Energy Kawasaki podium. Cianciarulo took the holeshot but was soon passed by Davalos. Davalos led the first three laps before crashing, dropping him down to fifth and giving Cianciarulo the lead. Cianciarulo and Baggett fought it out, swapping the lead on Lap 7 before Cianciarulo was able to pull away for the win. Meanwhile, Davalos worked his way back near the front, benefiting from a crash to Storm Lake Honda’s Gavin Fiath on Lap 8 to move back into third place. 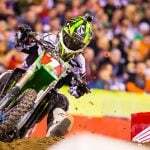 Cianciarulo’s win makes him the first rider to win his first career Supercross start since Trey Canard in 2008. The 2014 AMA Supercross season continues Feb. 22 at the Georgia Dome in Atlanta. 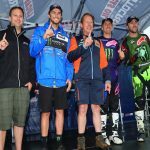 Villopoto will enter Georgia with a 12-point lead over KTM rookie Ken Roczen who finished sixth in Texas. Stewart is a couple of points behind in third place, and he’ll be looking forward to his next victory which would tie Ricky Carmichael for second all-time in the premiere-class wins list at 48 behind Jeremy McGrath’s astonishing 72.